Gov. Kevin Stitt speaks on the House floor at the Capitol during his first State of the State address on Feb. 4, 2019. In a 33-minute speech Monday to kick off the 2019 legislative session, Gov. 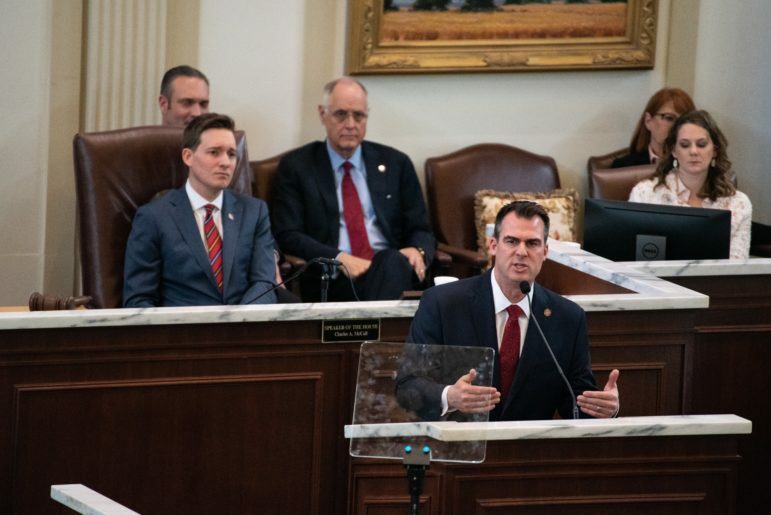 Kevin Stitt filled in some details on how his administration intends to make Oklahoma a national leader in education and business recruitment and improve government accountability. 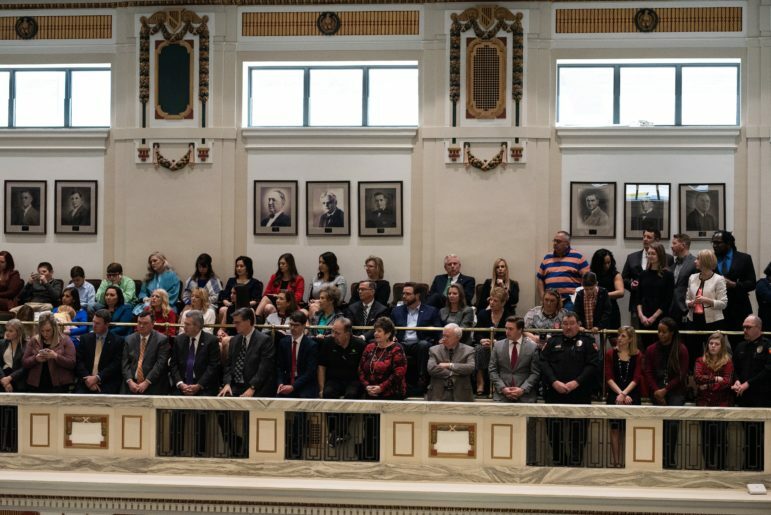 Stitt used his first State of the State address to call for an additional pay raise for teachers, a more modernized state government and greater control over state agency leaders’ employment. What was absent, however, might be as important as what was included. Stitt spoke of shoring up the state’s Rainy Day Fund in order to prudently use the extra money that last year’s tax increases brought in. But he didn’t call for a rollback of the taxes, as some critics feared. His call for more money for teachers, while appealing to many, doesn’t address many educators’ calls for more classroom spending. And the realities of criminal justice reform could hit a wall with district attorneys’ resistance and the fact that the state will likely need new prisons regardless of what the Legislature does. Here are excerpts from the written speech and Oklahoma Watch reporters’ annotations. Gov. 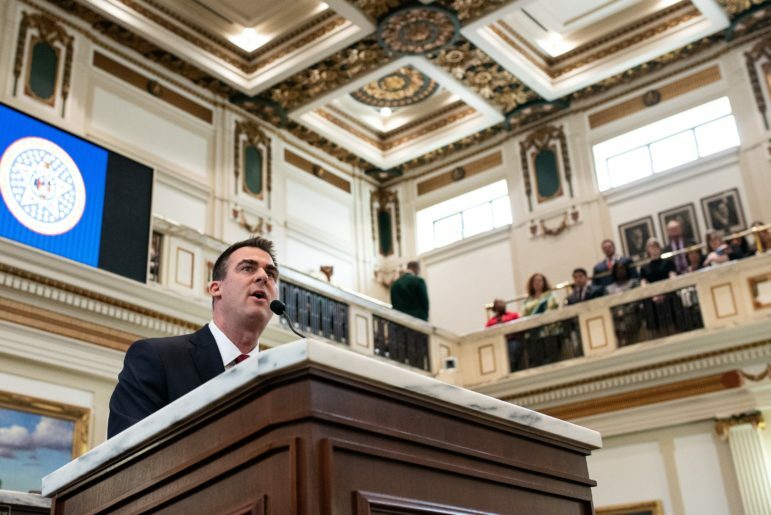 Kevin Stitt speaks during his first State of the State address. The speech kicked off the 2019 legislative session. Stitt isn’t the only new face at the Capitol. This will also be the first session for Pinnell, several other statewide officials and a host of new lawmakers, with 46 new lawmakers in the 101-seat House and 12 in the 48-seat Senate. Stitt repeatedly spoke about the need for a “turnaround” and his goal to make Oklahoma a “top 10” state on the campaign trail. He has also frequently tried to distance himself from fellow Republican and former Gov. Mary Fallin, and her eight years in office. 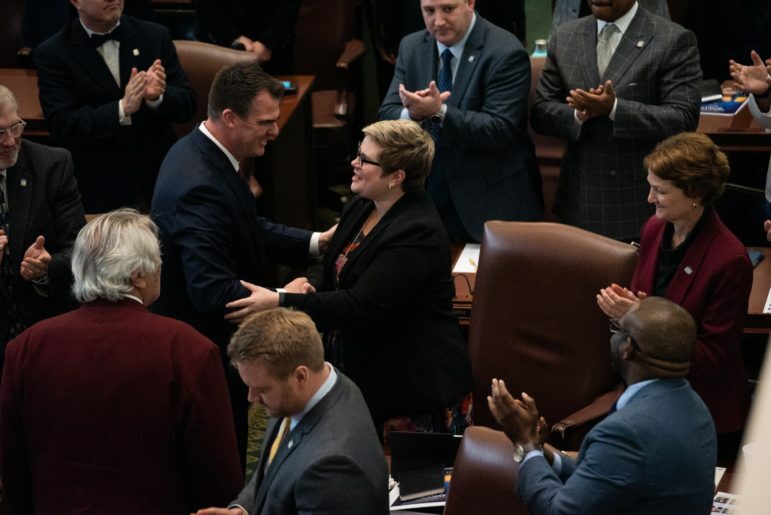 Instead of hoping to build upon her work, Stitt offers something of a rebuke of her time in office by speaking of the need for a turnaround and a new way of governing. Stitt has tapped into private-sector expertise to fill many of his top jobs. But not all of his appointees are political newcomers. Michael Junk, Stitt’s chief of staff, was Tulsa’s deputy mayor, and Stitt’s choice for secretary of state and education (and liaison to the Legislature), Michael Rogers, was a state representative from Broken Arrow and chair of the House Education Committee. A crowd of representatives, officials and others applaud Gov. Kevin Stitt during his State of the State address. Being top 10 could mean a number of things. In education, it could mean teacher pay or classroom spending. It could mean class sizes or test scores – or, for that matter, the magnitude of a rise in test scores. In business recruitment, it could mean the size of a closing fund or the success of such an incentive. Stitt didn’t include a boost in classroom spending with his call for a teacher pay raise and has offered few details so far on other aspects of his top 10 ambitions. 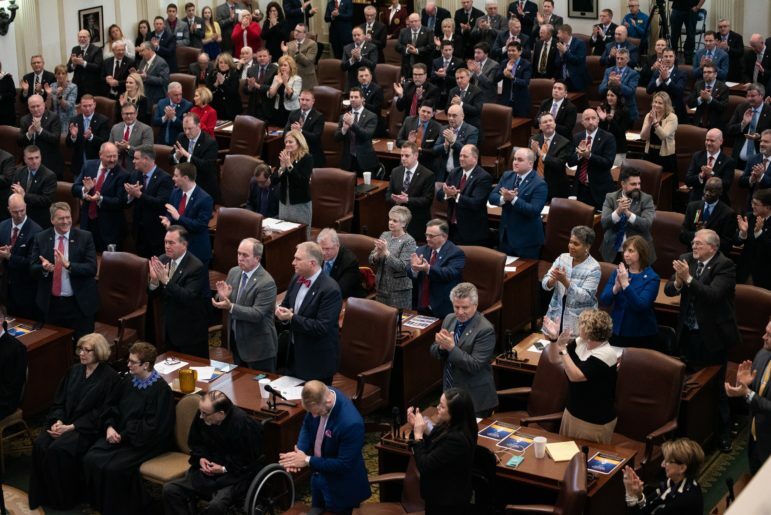 This is the first time in several years that Oklahoma has a surplus instead of facing a budget shortfall at the start of a legislative session. But how much money policymakers will have to save or spend won’t be known until the Board of Equalization meets to certify the final revenue figures later this month. State budget officials expect a drop in drilling activity due to falling oil prices over the past several weeks and months, which could cause the state’s surplus to be reduced by $50 million to $150 million. Stitt, who created Gateway Mortgage Group and grew it into a national mortgage lender and servicer, has spoken repeatedly of the private sector’s role in job creation and his experience in employing thousands. In saying that a focus on economic health will underpin policy decisions, Stitt seems to be saying he wouldn’t look kindly on tougher regulations when they come at the expense of business growth. Gov. Kevin Stitt shakes hands with House Minority Leader Emily Virgin, D-Norman, after the State of the State address. The Legislature made an emergency appropriation of $30 million last year to the Health Department. A grand jury report and investigative audit later found out that money wasn’t needed and the agency had not been honest about its finances. The agency hasn’t spent the money, and Stitt wants to take it back to pay for performance audits at nine more agencies under the Agency Performance and Accountability Commission and use the rest of the funds for economic development through the governor’s Quick Action Closing Fund. Stitt wants to be able to appoint directors for the following agencies: Oklahoma Health Care Authority, Department of Corrections, Office of Juvenile Affairs, Department of Mental Health and Substance Abuse Services and Department of Transportation. The governor already has the authority to appoint the commissioner at the state Health Department and the Department of Human Services, as well as some executive positions like adjutant general and emergency management. Although supporters say the governor should have a say who is in charge of state agencies, there likely will be resistance among those who feel an appointed board or commission can offer more expertise in these decisions and shield agency heads from political pressure. The Agency Performance and Accountability Commission, a group lawmakers formed in 2017, spent more than $1.3 million to audit the Department of Corrections, District Attorneys Council, Department of Public Safety, Office of Management and Enterprise Services, Oklahoma Tax Commission and Office of Juvenile Affairs. Stitt wants to expand that work to the Oklahoma Health Care Authority, Department of Education, Department of Human Services, Department of Transportation, State Regents for Higher Education, Department of Mental Health and Substance Abuse Services, Department of Health, Department of Career and Technology Education and the Department of Veterans Affairs. The governor’s office hasn’t said how much it expects the audits will cost. We will also reimagine state government so that our customers – Oklahoma taxpayers – are the primary focus. This is why I have placed a special emphasis in my administration on the digital transformation of state agencies. Today, I am calling for the Legislature to fund a $20 million grant program where agencies can apply to receive funds to bring their services into the 21stCentury and to make government more customer-centered and efficient. The Legislature had balked at Real ID drivers licenses before authorizing the Department of Public Safety to comply with the act in 2017. However, the licenses won’t be ready until at least 2020, when system upgrades and security measures are expected to be completed. In the meantime, Oklahoma has been seeking extension and the state faces another deadline in October to bring its license into compliance with the federal law. 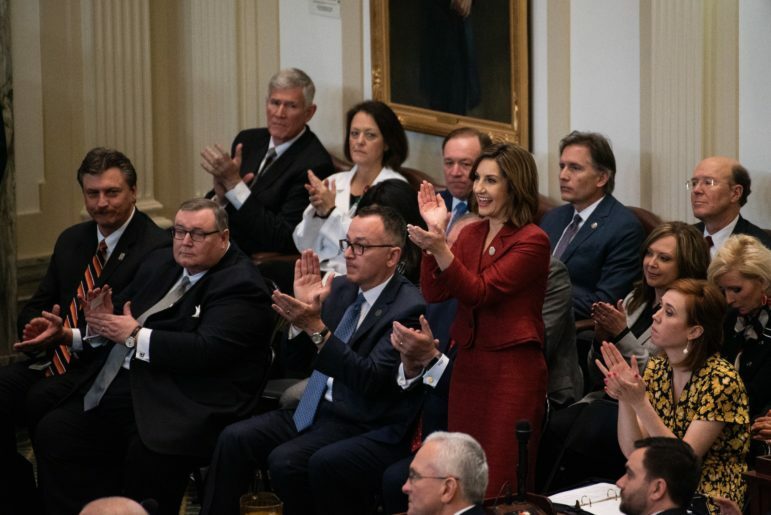 State Superintendent of Public Instruction Joy Hofmeister stands and applauds Gov. Kevin Stitt during his first State of the State address. Stitt called for an additional teacher pay raise on top of last year’s pay hike. Turning our attention to education, my administration is committed to public education and understands that the large majority of our students attend public schools. Over the next few years, we will move the needle in outcomes. We will set high standards. We will enact reforms. We will invest in the classroom. We are confronted with a nationwide teacher shortage. This is not a problem unique to our state, but Oklahoma was among the hardest hit. With recent revenue growth, I ask the Legislature to bring our teachers to number one in our region in pay and benefits. This amounts to a $1,200 increase per teacher. This is less than the Oklahoma Education Association’s ask of $3,000. But the state Education Department’s budget request doesn’t include a pay raise, instead focusing on operational dollars to reduce class sizes. House Minority Leader Emily Virgin, D-Norman, provides a response to Gov. Kevin Stitt’s first State of the State address. Stitt is said to be a fan of moving Oklahoma to the Praxis, which is the exam used by most other states. The opportunities Stitt is referring to here are converting to a charter school, which Millwood did in 2017 to retain emergency-certified teachers who were unable to get certified after two years. A legislative task force studied the education funding formula last year. The funding formula has not been changed since the early 1980s. Critics say allowing local districts more flexibility on how they spend their money leads to unequal funding and more inequities in educational opportunities. Guests pray on the House floor before Gov. Kevin Stitt’s first State of the State address. Stitt has been a vocal supporter of criminal justice reform, saying Oklahoma should work to bring its incarceration rate closer to those of its peers. Fallin issued an executive order in 2016 prohibiting state agencies from asking about applicants’ criminal histories on job applications. In my budget, we will also use revenue growth to address two critical healthcare programs in Oklahoma: The Graduate Medical Expense Program to train doctors, a cost of $62 million, and the Children’s Health Insurance Program, a cost of $14.8 million. 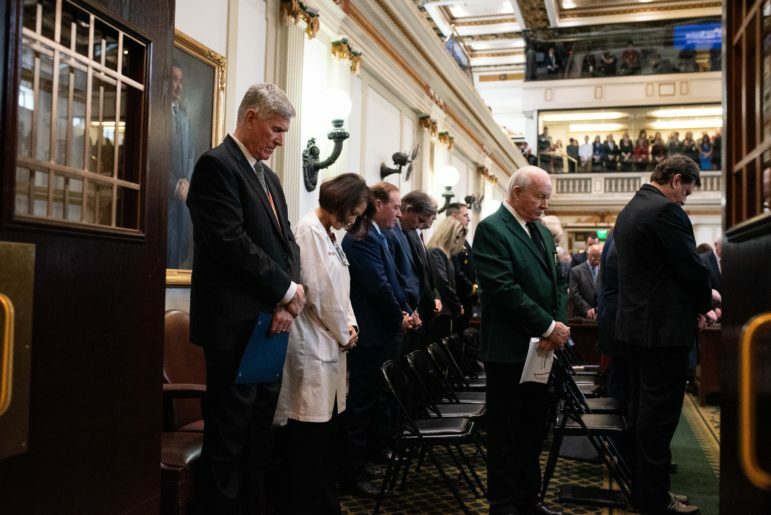 In late 2017, the state lost its waiver that allowed it to attract extra federal funds under Medicaid for medical schools at the University of Oklahoma and Oklahoma State University. There have been mixed messages on Stitt’s openness to Medicaid expansion. He’s been against it on the campaign trail, but said he was somewhat open to new ways of attracting more federal money for Medicaid at an Associated Press legislative forum last week. However, he seemed in the State of the State speech to the slam the door on Medicaid expansion in Oklahoma. During his gubernatorial campaign, Stitt became one of the most vocal candidates speaking out against tax increases. In addition to signing former U.S. Sen. Tom Coburn’s seven-point “Taxpayer Platform,” which calls for limited government and fair taxation, Stitt also said last year’s teacher pay raises could have been passed without increasing taxes. In his first budget, at least, Stitt lives up to his talk as his budget doesn’t call for tax increases or major revenue-raising policies. Attendees line the House gallery s to hear Gov. Kevin Stitt’s first State of the State address. Oklahoma’s Quick Action Closing Fund has spent more than $10 million on six projects since 2013, according to the Department of Commerce. This hasn’t been a priority to fund as the state faced a succession of budget shortfalls. Stitt wasn’t explicit about the use of tax incentives on the campaign trail, but his budget book includes a section on the various income tax credits, deductions and exemptions in the state’s tax code. They total about $1.5 billion. Another $985 million is in sales tax exemptions. service charges and federal grants were $17.3 billion as of last year. But state appropriations — money that the Legislature gets to direct — was $7.5 billion of that. The obligations Stitt is referring to include about $100 million in ad valorem reimbursement to local school districts, $62.8 million that the federal government clawed back as part of a dispute over Oklahoma’s use of the money to help fund graduate medical education, about $20 million for teacher flexible benefit allowances, $19.3 million for the Capitol renovation, $14.8 million for the Children’s Health Insurance Program, $7.1 million for debt service obligations and $12.8 million to rebuild the state’s medical lab. Stitt seems to allay concerns that he would support rolling back last spring’s tax increases. The governor’s budget staff said they’d like to increase the Rainy Day Fund cap to 30 percent of the revenue estimate for the general revenue fund, up from 15 percent now. That change would require voter approval in a state question. Stitt’s proposal to save the $250 million instead of spending it on immediate needs is expected to be a contentious issue this year. 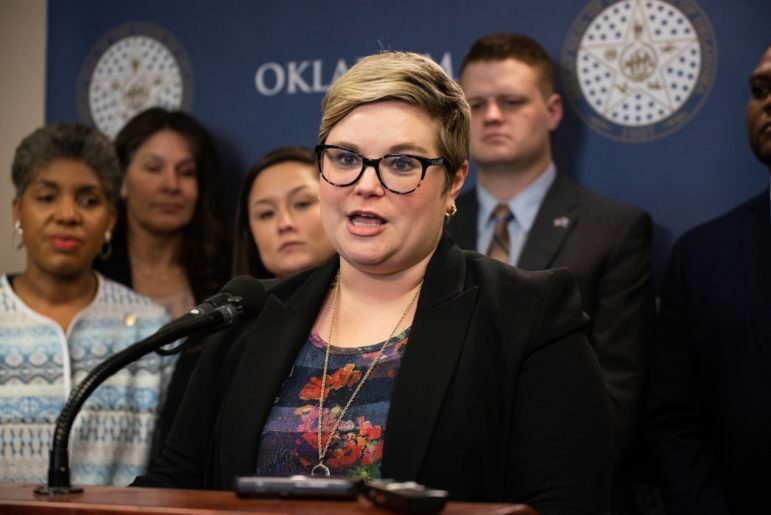 Although Republican leaders applauded this conservative approach, House Minority Leader Rep. Emily Virgin, D-Norman, said that money could be used to further boost education spending or pay for health, corrections and other state needs.